Really annoying. Can the “history of mankind” (starting with the big bang and continuing into the future) be told in 400 pages including a few illustrations? Harari certainly gives it his best shot in this sporadically organized work of over-generalization, cherry-picking, digressions, and skipping around. There are places of interest but also too many really annoying parts. Overall, I’m impressed only by the ambition of this project. The scope? The history of human-kind, homo sapiens, divided into sections which aren’t terribly neat and tidy, but perhaps that goes with the territory – lol. The Cognitive Revolution – huh? Did this happen all at once? Did Sapiens go from rote memory to abstract analyzing, evaluating and creating in one massive jump? Harari seems to idealize the forager folks. But then he finally has to move on to the Agricultural Revolution when some real troubles started. Was the era of foraging, hunting and gathering really so idyllic as Harari implies ? And was the agricultural era following such an entrapment into misery? 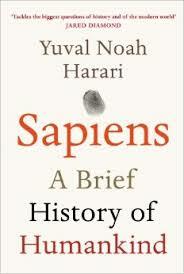 It is at times a fascinating study and Harari writes nicely, but I do have some issues with what all he’s claiming. If banks are fictions we tell ourselves and believe, then what about the Big Bang story – how is that not a fiction? Or evolution? Fictions the scientists tell us are apparently not to be called that – those are “theories”? Moving on in the book there is a section called “The Unification of Mankind” which deals mostly with the broad brush ideas of the Agricultural Revolution. After that comes the Scientific Revolution encompassing the Industrial Age and Exploration – Then we get to today. En route Harari examines things like why men are universally accorded more power in societies – and for all his love of science, imo he gets it wrong. (Biologically, male sperm are more aggressive and shorter lived than female sperm – does this not simply follow through?) He hits on social topics like mating behavior, death, consumerism, religion, war and even general happiness. Overall, it seems he thinks foragers had it best – well, maybe – but he kind of skims over the women’s work of chewing and sewing leather, child care, etc. Wouldn’t it depend on where they tried to hunt and forage? And if hunting and gathering were such an easy life, more suited to Sapiens than agriculture, why didn’t some communities, where the population didn’t boom due to agriculture, go back to it? There are parts which are quite interesting, but much of this book is common sense, another chunk is tedious and there are times when it’s just an overload of Harari’s ideas. How far can hypothesizing logically go without source-able material evidence to back it up? (Or is it all fiction anyway?) And then, to compound the problem Harari generalizes ad absurdum as well as setting up straw men. I got rather tired of it during his dissing of the Agricultural Revolution, emphasis on wheat – and that wasn’t even halfway through. My take was different. I found Harari dazzling in his philosophical speculations.